Saxophonist and Prism Quartet founder Matthew Levy has spent his career getting other composers played; now the spotlight's on him in a new CD, and what a brilliance it reveals. Call the Prism Saxophone Quartet contemporary-classical, call them avant-jazz, even call them omnivorous, but whatever you call them, they've been setting the gold standard for three decades. 2014 is in fact their 30th anniversary, and in that time, while centered in Philadelphia, they've been everywhere, stretching styles while inhabiting classical, jazz, world, and rock idioms. Prism has commissioned more than 150 works, but in People's Emergency Center (Innova) they turn the entire two-disc set over to Matthew Levy. People's Emergency Center is the first movement of Been There, and is also the name of a shelter helping women and children in West Philadelphia. It and the second movement, Gymnopedie (the word Erik Satie coined for his most famous piece), are culled from Levy's music for a documentary about the shelter. The Prism four (Timothy McAllister, Taimur Sullivan, Zachary Shemon, and Levy), bass, drums, guitar, and former Prism member Tim Ries on soprano saxophone all create magic with swirling precision. Levy's voice is at once vernacular and otherworldly, steeped in jazz but living in—as Henry Cowell would have it—the whole world of music. Serial Mood seems to ponder that post-Schoenberg world of harmony, and in doing so reveals a tasty secret known to Dizzy Gillespie, Gunther Schuller, and a few other hep cats: If you play 12-tone music with a hard, swinging beat, it sounds for all the world like be-bop. That's one of the unexpected treats that Levy offers. Another is the overarching spirit of generosity—to the listener and to each player. All the music of his I've heard exhibits this. Whether it's rhythmically striking, sonically challenging, or a charming tune, it is genial music offered warmly to a real world filled with real people who want something good to hear. An excellent example is Brown Eyes, which here employs the whole band, but which Levy first had played in public in a smaller version. The occasion of the premiere? His wedding. Somebody's looking out for us on Now Is the Time, Saturday, May 10th at 9 pm at wrti.org and WRTI-HD2. Genius loci is the spirit of a place, guardian spirit, or guardian angel; Frank Brickle's short work Genius Loci for mandolin and guitar is both whimsical and expansive. The Stone Tower looks over the artist colony of Yaddo, and is also the name of the first movement of Ned Rorem's Flute Concerto, written for Jeffrey Khaner, who performs it here. 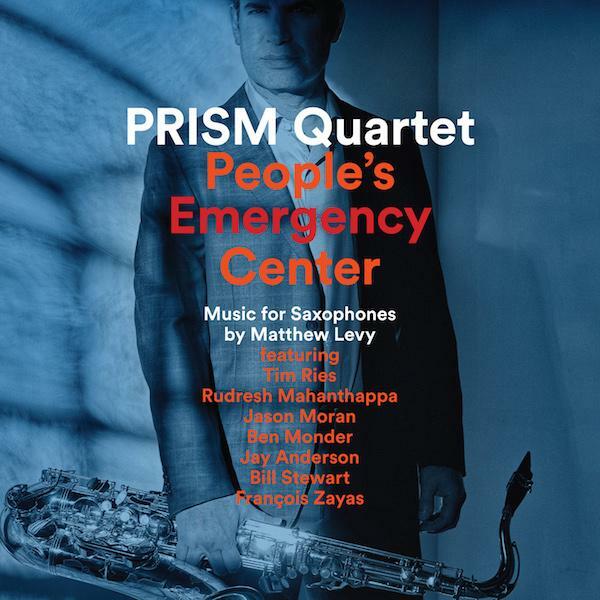 Prism Saxophone Quartet founder Matthew Levy begins and ends the program with music from his new CD, People's Emergency Center. That's the name of a shelter helping women and children in West Philadelphia. It, too, is a first movement title, of Been There, music from a documentary about PEC. It's for Prism plus bass, drums, guitar, and another saxophone, as is Brown Eyes, which carries with it another great spirit. Matthew Levy had it performed at his wedding. The mission of the all-saxophone, Philadelphia-based quartet is to commission and disseminate new works for the saxophone. In celebration of PRISM's 25-year milestone, they presented Dave, The Premiere - new music composed "by guys named Dave," on June 4 and 5, 2010.